Today ends National Poetry Month. Clearly, I haven’t written a poem every day as many have. But I’ve really enjoyed my favorite poets’ contributions throughout the month! Here and the following are why I use poetry as a spiritual tool. that we can’t say in “normal” speech. we can say in poetry. I see this image as a blessing! and how they chose to respond. I didn’t feel were complete. and this, too, I regretted. to pray what needs praying. even welcomed with open arms! that is the essence of God! “No one can serve two masters, for either he will hate the one and love the other; or else he will be devoted to one and despise the other. You can’t serve both God and Mammon. A reminder to seek God’s Kingdom (Heaven within) first, and everything we need will be added (Matt. 6:33). And while we’re thankful for degrees, jobs, projects, our families, friends, and accomplishments in the world, we cannot serve the world and gain lasting security. He said to all, “If anyone desires to come after me, let him deny himself, take up his cross, and follow me. For whoever desires to save his life will lose it, but whoever will lose his life for my sake, the same will save it. For what does it profit a man if he gains the whole world, and loses or forfeits his own self? With this knowing in my heart, I gratefully acknowledge my Master of Metaphysical Science degree (4/4/14). But the credit is not mine; without God working through me, I would not have this and indeed would not have Life at all. For God is my King. Is done by The One. And through me it runs. I’m aware of my Life. To flow and to ebb. 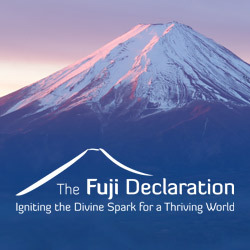 Bringing Spirit into us, releasing It to others. The music within; so beautiful, so uplifting! True, pure music… Clean, unblemished by human experience, unlimited in its sweetness, love and beauty! 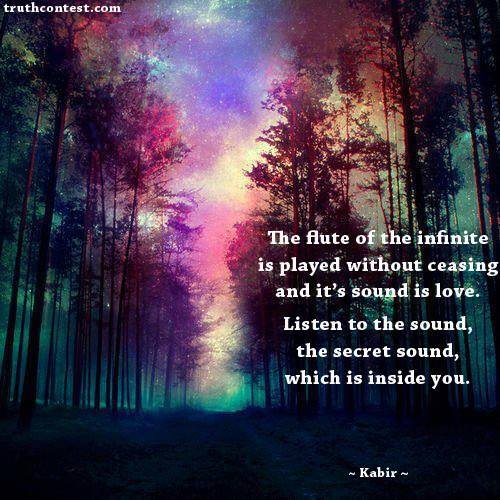 “The flute of the infinite is played without ceasing and its sound is love. 1. Thank you, Mother Earth. I can feel your support. I live fully and free. 2. Thank you, Mother Earth. In the calmness I rest. In my body I’m blessed. I am strong. I survive. I am gentle and I thrive. As I give you my care. Though upon you I trod. Do you Feel My Presence when the Night is Dark? When the Path is Difficult? Do you Understand How Greatly I Care? That My Love is Unconditional? That you Need Change Nothing? I Only Want to Bless you. How I Long for you to stop and Hear My Whisper. Shouting down from the Vastness of Love, Reaching for you. How I Long to Share this Love with you. Will you Pause from your haste? Will you close your eyes to the world and Listen for My Voice of Love? Will you Trust Me, that I will neither Blame you nor Forsake you? I Love you, O My Beloved. Will you Love Me in Return? God is at the yard sale. In the piles of junk, God waits. In the people so excited to find that special thing, those canning jars, fishing tackle, car parts, musical instruments, God stirs. God is in the relief they feel when someone buys up their old stuff. God is in the coins and bills exchanged. God is in the joy of having money to save or spend, and having a clean basement, closet or garage. God is in the people who go home ecstatic, the kids with their new old stuffed animals, The mothers with their purses and skirts, crock pots and someone else’s nana’s china. The bachelors with their motorcycle helmets and tool boxes. The fathers with their swing sets, slides, play houses, breathing a sigh of relief, “Thank God it’s in good condition!” Realizing they got a bargain and they’re grateful for it, even though they tell you only women are bargain hunters. God is at the yard sale. Within the stereotypes, within the piles of junk, inside the bargain hunters, and right there guiding the people who decide what to sell. God is there. At the yard sale and beyond, before, and after. So the next time you visit a yard sale, and you will, you know, remember: God is in the people passing on their things. God is in the things themselves, that like their former owners, are getting a clean slate today. And God is in you, yes, even at a yard sale.